Leading into tonight and after nearly 2 years, I had observed 71 of the Messier objects. The remaining 39 objects consisted of 3 Nebulae, 3 Open Clusters, 7 Globular Clusters and 26 Galaxies. It is those last galaxies that give me the biggest mental roadblock and there is no cluster of galaxies more daunting than those in the Constellation Virgo. The evening was originally going to consist of objects in and around Ursa Major. I had a list of 6 targets planned but seeing conditions and light pollution only allowed me to view M106 in Canes Venatici. No other object would show a hint of detail. Frustrated, I noticed that most of Virgo had risen above my neighbors tree. I had not been planned on jumping into this daunting region of galaxies tonight, but thought it was worth a shot. 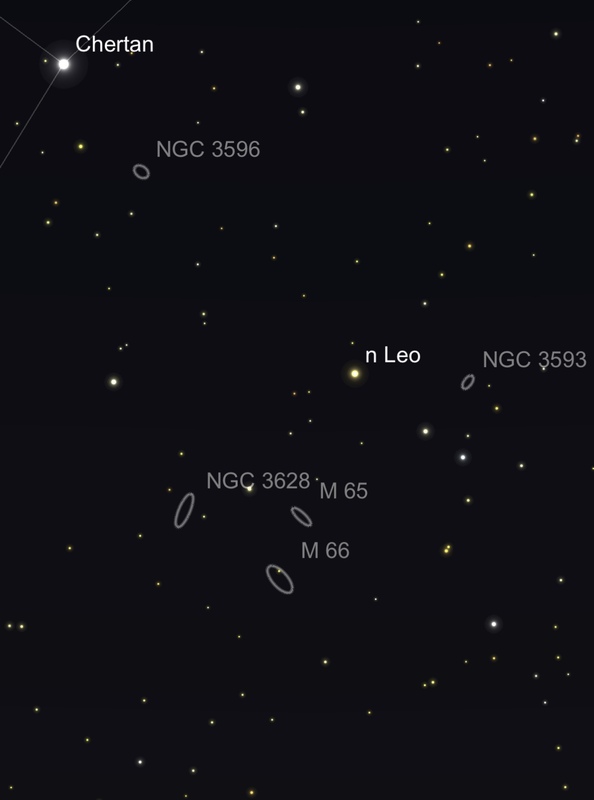 Starting in the northern portion of Virgo led to initial discouragement with objects such as M96, M85 and others not showing up. At this point, I was starting to become frustrated. Of the 10 objects I had attempted to observe thus far only 1 had been visible. For all others, the star patterns matched perfectly with my charts but where the galaxy should have been a dark void existed. At this point, I’m thinking I will have to go off site to darker skies for more Messier objects than I had bargained for. I decided to give a few more attempts before calling it a night but this time started from the southern point of Virgo. To my surprise, two galaxies, M59 and M60 appeared in the eyepiece. 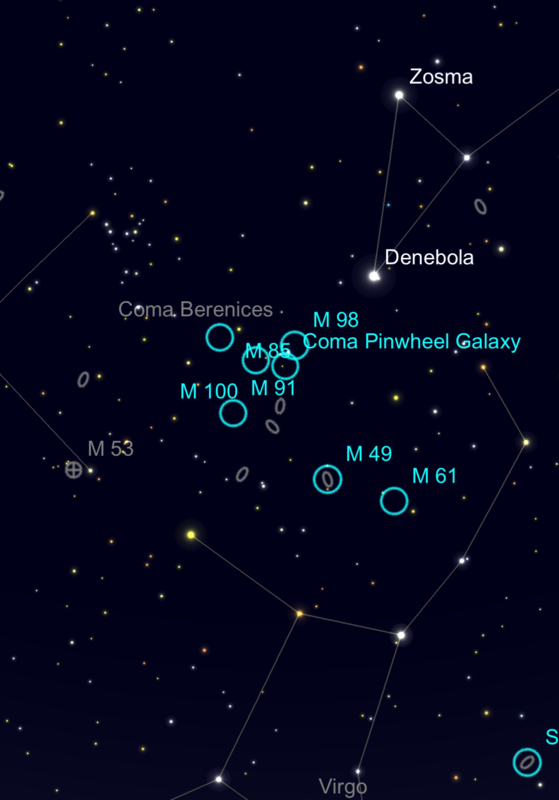 Moving up Virgo, I used M89 as a central point to jump to M90 and M58. 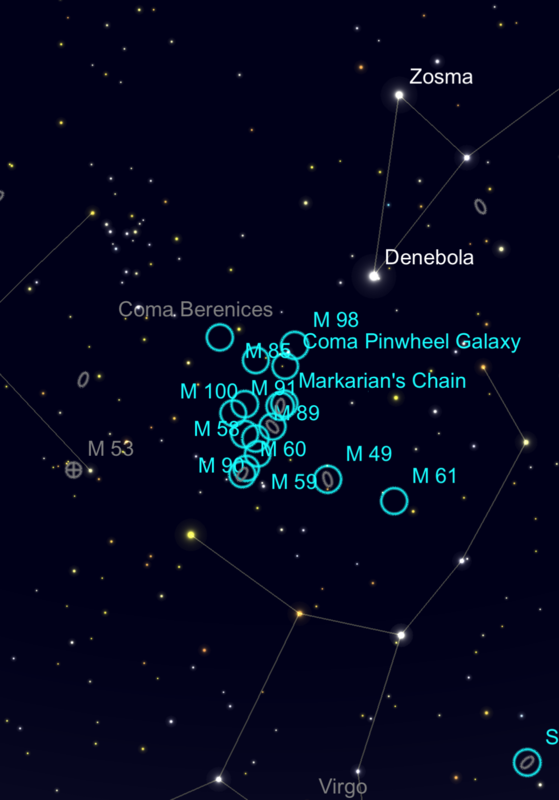 Star hopping took me to M87 and then up to Markarian’s Chain, M84 and M86. One final sweep through Virgo revealed M88. With Ursa Major a bit higher in the sky and observing conditions improved, I moved back over and was able to catch M102 before concluding the night. Galaxies such as M88 and M90 at +9.36 magnitude were pushing the limit of what I was comfortable verifying as observable targets through my skies. Using 96x magnification and averted vision helped with these observations. Others such as M87 were surprisingly easy to view. Depending on the size and surface brightness of the object it appears the limits of my sky and telescope are around +9.5 magnitude. 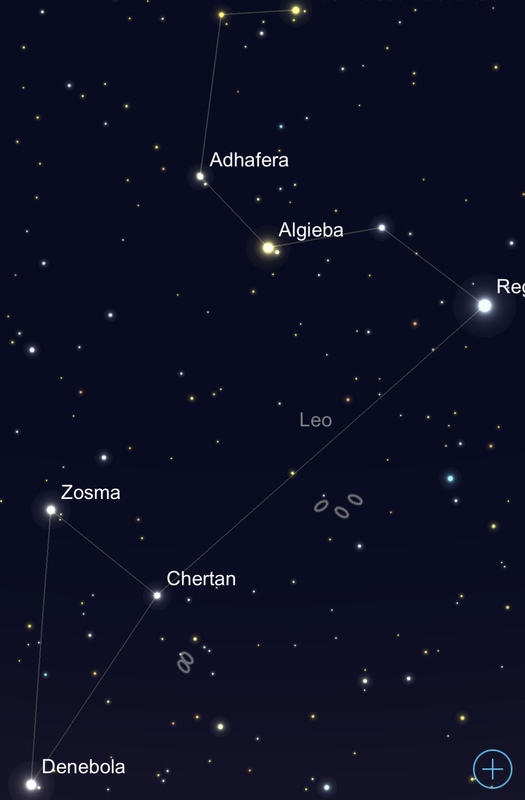 What I thought would be a nice evening in Ursa Major ended up being a surprisingly productive evening in Virgo. It appears I’ve overcome my Virgo phobia. Upon completion of cataloging four constellations Saturday night, I realized that five galaxies needed for my Messier observing book lay in Constellation Leo. Galaxies have been quite frustrating from the confines of suburban skies. Yet, with a steady atmosphere and the Moon yet to rise, I thought an attempt at these wouldn’t hurt. Star jumping from Chertan over to M65 and M66 left me pleasantly surprised as these two galaxies appeared prominently through my 8 in. dobsonian at 48x magnification. Being able to view these at +8.91 and +9.16 magnitudes excited me at the potential to observe other galaxies, from my location, in the Messier catalog. This led me to test the limits of observing magnitudes even further. I star jumped, with much more difficulty, to M95, M96 and M105. Of these three objects, M96 appeared fairly easily as +9.13. I used it as the central point to verify the locations of M95 and M105. 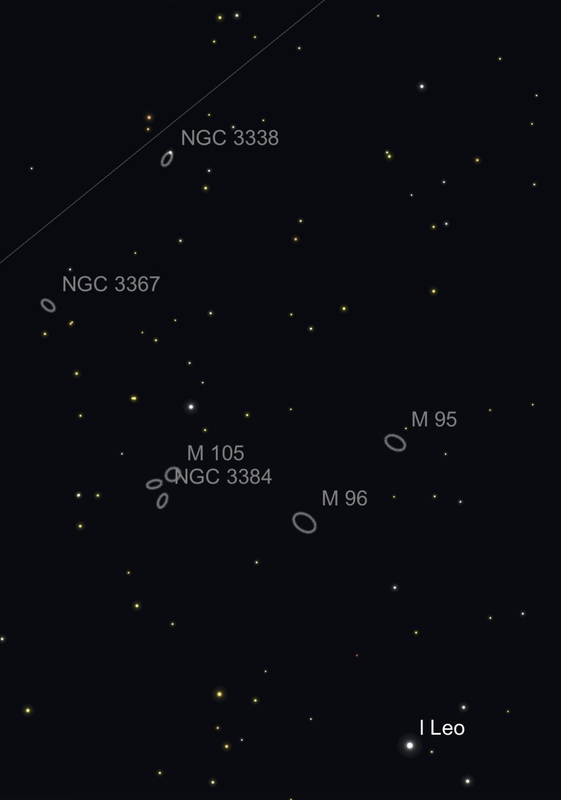 Of these three M95 at +9.72 was the most difficult to spot, pushing the upper limits of what I could view. #1: My eyes were dark adapted fairly well for a suburban neighborhood. #2: It was an exceptionally clear and steady night with seeing conditions being very good and transparency at a level 6. Up next for the Messier catalog will hopefully be 5 galaxies and the Owl Nebula located in Ursa Major. 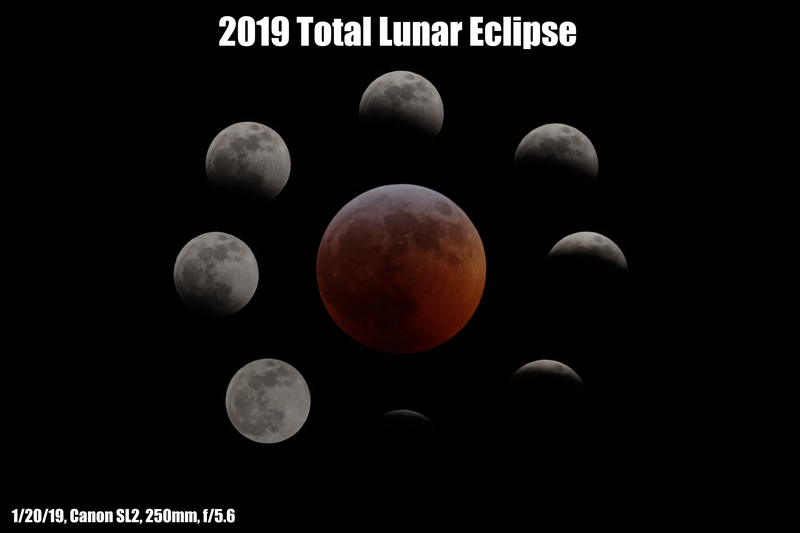 On a frigid night of 16 degree temperatures, I set up my telescope and DSLR to experience and document the 2019 Total Lunar Eclipse. Having just purchased a refurbished Canon 55-250mm f/5.6 lens, this was a prime opportunity to test out its abilities. Attaching the iPhone X to the telescope allowed me to stream various parts of the eclipse for others (mainly my students) to watch. While that was going on, I manually focused the DSLR on the Moon at 250mm and snapped a couple dozen pictures from the beginning of the eclipse through totality. What began as a slowly creeping shadow across the lunar surface morphed into a dim red glow as the Moon moved into totality. As the Moon continued to dim the shutter speed and ISO were continuously adjusted to compensate. Shutter speeds varied from 1/1000 to 1 sec and ISO ranged from 100 to 800 from Full Moon to the dimmest point of totality. Through my excitement, I had forgotten how cold it was and started to feel a tingling pain in my toes that made me quickly call the evening to a close a little after midnight. The next day, I began work on the following sequence of shots taken during the Lunar Eclipse. The image of the Blood Moon was doubled in size through editing and this collection of shots was put together using GIMP 2.10. I am not very good with names. Be it people or stars. This observing program should help to familiarize myself with the constellations and some of the major stars that form them. I particularly enjoy the observing programs that require some sketching, and after 39 Northern Constellations, I should be a good bit better at recognizing the night time sky. To assist me in these observations, I have purchased a “Planisphere”. As a child, I could never match these correctly with the stars. I’m hoping for better results in my 30’s. Retracing the history and observations of the man who birthed the hobby is the purpose of this observing program. From the Moon to the Sun and the planets, the goal is to recreate the observations of Galileo. This one involves a variety of challenges that I am greatly looking forward too. For the past two years, I have been a member of the Roanoke Valley Astronomical Society. From day one, the club has been incredibly welcoming and has increased my interest in amateur astronomy as I posted in a previous article. After serving as Secretary for the past year, last month I was appointed President. I am thrilled to be in this new role and appreciate the confidence of those who encouraged me to accept this new position. If any of you have an interest in astronomy, please check out our website and stop by our next club meeting in downtown Roanoke. 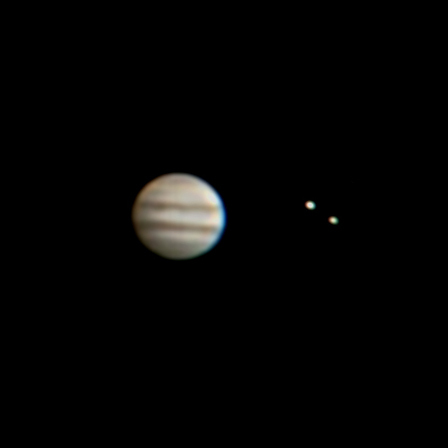 Tonight, I completed my imaging goal for the summer. Mars, Jupiter and Saturn have all been filmed, stacked and processed using a DSLR camera. All three of these images were captured at f/11.8 which means the images above are at accurate scale to each other as viewed through the Orion Xt8i. Mars was the last holdout, with the dust storm washing out most detail during my earlier attempts in late July. 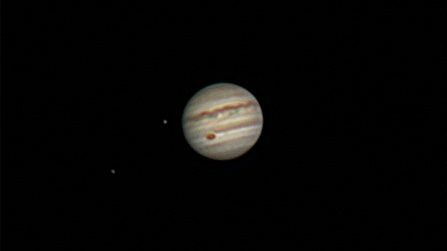 For comparison, below are my previous images of these three planets taken with an iPhone 6 back in 2016.